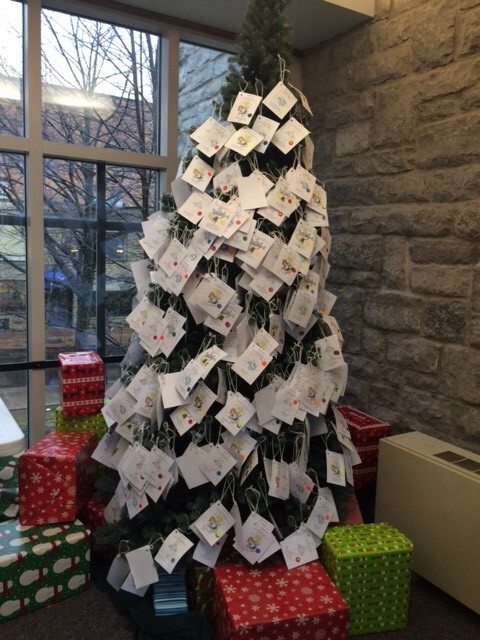 The Angel Tree is covered with tags of purchased gifts at State College Presbyterian Church. It started as a “birthday party for Jesus” in the early 1990s and has turned into an outreach that annually provides gifts for hundreds of people in central Pennsylvania. The Angel Tree Ministry at State College Presbyterian Church supplies presents for close to 20 nearby agencies that in turn hand them out to the people in need they are connected to. Each year, service organizations in the State College area are asked by State College Church to reach out to their clients to see what they need during the winter season. Those lists, which also include items needed by the agencies’ staffs, are then collected by the congregation and made available to its worshipers. The distribution of the gifts back to the agencies is also done by a group at State College Church. 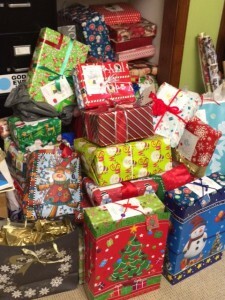 The Angel Tree Ministry, overseen by the State College Church’s Social Justice and Mission Team of which Maggie is a member, began 26 years ago after the Sunday School classes at the church were bringing in gifts for the local service agencies as part of their birthday party for Jesus. “It got to be too much because there was a birthday party going on, kids were running around eating cake, and we decided, ‘Wouldn’t it be better to have this open to everyone in the church and have people encourage their children to sign up for gifts for another kid?’” Maggie recalled. 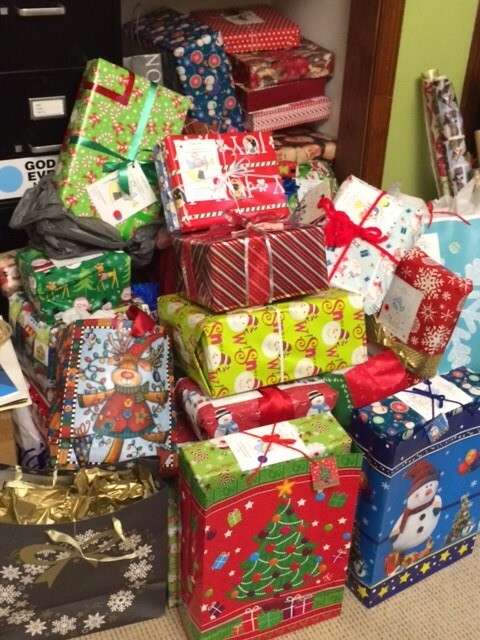 Gifts purchased by the State College Church worshipers are ready to be delivered to area service agencies. 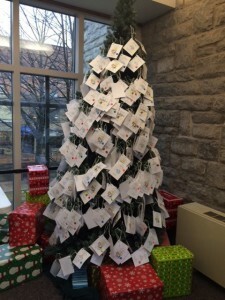 Among the agencies that benefit from the Angel Tree Ministry are the Youth Service Bureau, Centre County Women’s Resource Center, Park Forest Preschool, Windy Hill Village senior living and Centre Volunteers in Medicine. In the preschool’s case, it receives sweatshirts from State College Church that are packaged for the families along with a Christmas dinner that is supplied by other local groups and delivered by the preschool. “One other thing about this is it keeps people informed about what the agencies are doing so they can have a personal interest in them,” Maggie said. After the lists of needed items is sent back to State College Church, the item description is placed in a box along with two paper angels. When an item is picked, one angel is hung from a Christmas tree in the church’s fellowship hall, signifying that the gift will be purchased, while the other angel serves as a name tag and accompanies the present back to the agency. Items for individuals that are needed include gift cards, clothing, books, blankets and towels. Agencies may seek for office supplies, paper, computer cartridges, cleaning supplies, vacuum cleaners, gas cards and postage stamps. Transitional houses are looking for quarters for bus transportation or laundry, underwear, sweatshirts, socks, snack foods, games and sports equipment. Last year, 825 items were requested from the nearby agencies, but because of that large number, not all the gifts are bought. Normally between 75-85 percent of the lists are filled by the congregation. While the goal is to have every gift on the list purchased, Maggie understands that that’s not always possible. Regardless, she can see the excitement generated throughout the congregation and all the good that is coming to those who are less fortunate in the State College area. 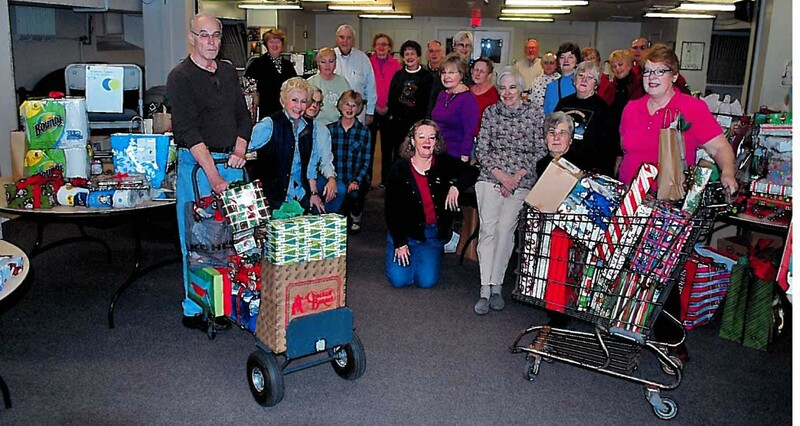 Volunteers have been the backbone to the Angel Tree Ministry at State College Church for 26 years.